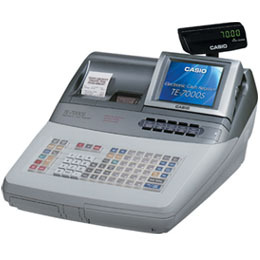 Innovative cash registers with color multi-line LCD screen for easy to operate and quick operation. Operator display unit can be adjusted to fit your best readable angle. * Multipurpose keys are located on the keyboard with pre-assigned functions. * These keys are possible to customize of its functionality as well as slide-in template to identify each functions. Selectable CASIO In-line cable or CAT5 cable. The TE-7000S and TE-8500F Inline added capability to use LAN cable "CAT5" make it easy and simple wiring since "CAT5"(category5) cable is widely used for these days. Optional device for the operator identification. * Pop up customer display with 10 digits numeric LED. * Optional customer display with 2 lines x 20 alpha numeric display.